We use Clenergy racking which carries a 10 year warranty and written engineer wind load certification to AS1170.2, giving you peace of mind in all weather conditions. All Racking systems that we use ensure adequate cooling of the PV modules (cooling is important to reduce the losses which occur when crystalline panels heat up during operation). This slightly raised profile also helps to allow leaves to blow through underneath the panels rather than build up which may cause a fire hazard. We use a high temperature (100C service temp) neoprene / nitrile / rubber gasket between the Aluminium feet and your roof material, offering a weatherproof seal and galvanic isolation between the dissimilar metals. We use Buildex fasteners with a neoprene seal as standard on our installations, their Class 4 corrosion resistance ensures a long service life. We use genuine Wiley WEEB washers for earthing PV array frames – these are purpose designed anodise piercing washers, that provide a gas tight, durable earth connection between array frames and PV module frames. WEEBs have been endurance tested and shown to be far superior than any other PV module frame earthing solution currently available. 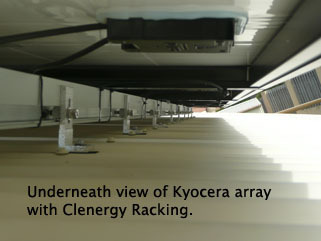 Refer to Clenergy’s website for more information on their racking.